The crew consisting of Ales Loprais, Ferran Marco Alcayna and Petr Pokora and driving their Tatra Jamal – Queen 69 have survived a rerun of dunes around the city of San Juan de Marcona and continues in the battle for a top rank at the Dakar Rally 2019. The Monday stage was one of the two loop stages prepared for the final part of the rally. The stage started and ended in San Juan de Marcona with only short liaison sections. But these parts of the route are not so relevant for the Dakar competition. The successes and failures are mainly decided during the specials. The one included in this stage was 331 kilometres long and took the competitors to the same dunes they had covered at the beginning of the rally. The ruts left after the first pass through the dunes some days before increased complexity of the route and confused navigators, and all this was multiplied by the fatigue after the week of intense racing and short night sleeps, fatigue of both people and machines. Instaforex Loprais Team were pleased before the start of the Monday stage by the deduction of 22 minutes from their overall time, lost by the crew of Tatra #507 on Sunday when they had to wait in a canyon behind stuck vehicles which could not be bypassed in any way. But then the mathematics was no longer interesting and Ales, Ferran, Petr and their Queen were again fully occupied by racing for the coming hours. The most important thing was to pass through the dunes in the best possible way, not to get stuck and collect all checkpoints on the way. “This was a hard job for the navigator but we passed it nicely and collected all waypoints. Although I am tired as dog I am happy to be in the finish and to be able to continue in our mission. Today the stage was very nice, I liked it very much after all, now this is Dakar as it should be. The only thing I am not happy with is our time loss,” admits Loprais, whose crew reached the finish of stage seven with the loss of one and three quarters of an hour after the winner of the stage, Gerard De Rooy. But even that was enough for the Instaforex Loprais Team to defend the fifth place in the overall standings. On Tuesday 15 January the rally will move to Pisco. Stage eight is 575 kilometres long and includes 360 km long special stage. 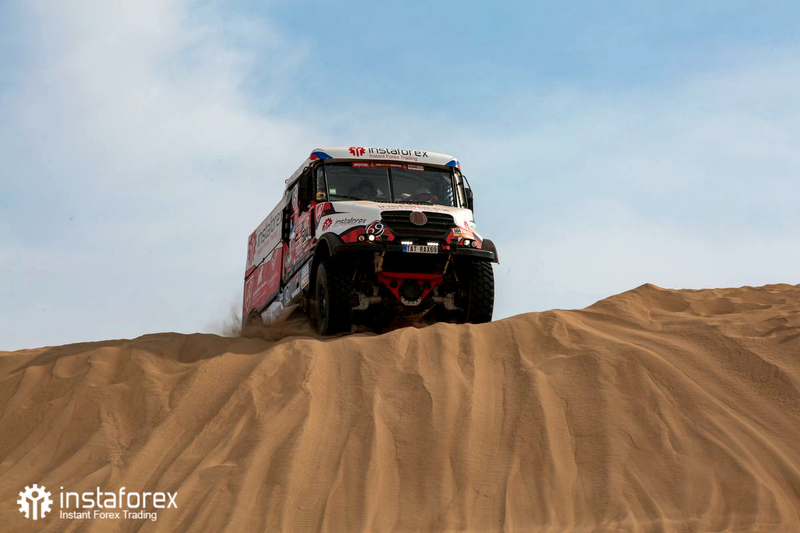 The race will again, for a second time in the course of this edition, return to the Ica dunes.